Otoshidama is New Year's money gift. 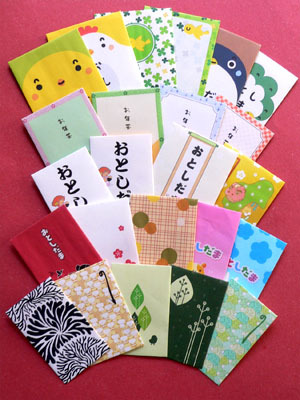 On January 1st, Japanese people have a custom of giving pocket money to children. The money comes from parents, grandparents and relatives this is known as Otoshidama, small gifts with money, colourful envelopes and a typical gift for a junior or senior high school student would be 2000 to 10000 yen ($20 - $100) per relative. That means that the money can add up pretty fast. So when children visit their relatives for New Year's greeting, they get otoshidama. As the child gets older the amount grows. Children often get otoshidama til they turn 20, or even yonger than that. Once you are an adult and if one of your relatives give a birth, then it's your turn to prepare an otoshidama for a new child.